IN the last chapter we noticed the work of Philip in Samaria, the present one will deal with the mission of the Apostles Peter and John to complete and perfect that work. The story, as told in the sacred narrative, is full of instruction. It reveals the ritual of the apostolic Church, the development of its organisation and practice, the spiritual lessons which the earliest gospel teachers imparted and the latest gospel teachers will find applicable. Philip converted the Samaritans and laid the basis of a Christian Church. Word was at once brought of this new departure to the Apostles at Jerusalem, because it was a new step, a fresh development which must have given a great shock to the strict Jewish feeling, which regarded the gospel as limited by the bounds of orthodox judaism. The Apostles may have felt some surprise at the news, but they evidently must have acknowledged the Samaritans as standing on a higher level than the Gentiles, for they do not seem to have raised any such objections to their baptism as were afterwards urged against St. Peter when he preached to and baptised Cornelius. "Thou wentest in to men uncircumcised," was the objection of the Jerusalem Church urged against St. Peter as regards Cornelius. The Samaritans were circumcised, and therefore this objection did not apply. The Jews, indeed, of Judaea and of Galilee hated the Samaritans with a perfect hatred, but neither hatred nor love is ever guided by reason. Our feelings always outrun our judgment, and the judgment of the Jews compelled them to recognise the Samaritans as within the bounds of circumcision, and therefore the Apostles tolerated, or at least did not except against, the preaching of the gospel to the Samaritans, and their admission by baptism into the Messianic kingdom. It is a phenomenon we often see repeated in our own experience. A brother or a relation alienated is harder to be won and is more bitterly regarded than a total stranger with whom we may have quarrelled, though, at the same time, reason, perhaps even pride and self-respect and regard for consistency compel us to recognise that he occupies a different position from that of a perfect stranger. The conversion of the Samaritans must be viewed as one of the divinely appointed steps in the plan of human unification, one of the divinely appointed actions gently leading to the final overthrow of the wall of partition between Jew and Gentile which the earlier chapters of this book trace for us. How beautiful the order, how steady and regular the progress, that is set before us! First we have the call of the strict Jews, then that of the Hellenistic Jews, next that of the Samaritans, and then the step was not a long one from the admission of the hated Samaritans to the baptism of the devout though uncircumcised Gentile, Cornelius. God does His work in grace, as in nature, by degrees. He teaches us that changes must come, and that each age of the Church must be marked by development and improvement; but He shows us here in His word how changes should be made, -not rashly, unwisely, impetuously, and therefore uncharitably, but gently, gradually, sympathetically, and with explanations abundantly vouchsafed to soothe the feelings and calm the fears of the weaker brethren. This method of the Divine government receives an illustration in this passage. God led the Church of the first age very gradually, and therefore we see the apostolic college steadily, though perhaps blindly and unconsciously, advancing on the road of progress and of Christian liberality. We have in this section of primitive Church history a twofold division: the action of the Apostles on one side, the attitude and conduct of Simon Magus on the other. Each division has quite distinct teaching. Let us in this chapter take note of the Apostles. I The Apostles who were at Jerusalem heard of the conversion of Samaria, and they at once sent thither Peter and John to supervise the work. The deacons had, for a time, appeared to supersede the Apostles before the world, but only in appearance. The Apostles retained the chief government in their own hands, though to the men of the time others seemed the more prominent workers. The Apostles gave free scope to the gifts entrusted to their brilliant subordinates, but none the less they felt their own responsibility as rulers of the Divine society, and never for a moment did they relinquish the authority over that society which God had entrusted to them. They felt that Christ had instituted an organised society with ranks and offices duly graduated, with officials—of whom they were themselves the chief—assigned to their appointed tasks, and never did they surrender to any man their Divinely given power and authority. Philip might preach in Samaria; but though he was successful in winning converts, the Apostles claimed the right of inspecting and controlling his labours. They successfully solved a problem which has often proved a very troublesome one. They combined the exercise of power with the free play of enthusiasm, and the result was that the enthusiasm was shielded from mistakes, and the power was vivified by the touch of enthusiasm and prevented from falling into that cold, heartless, ice-like thing which autocratic rule, in Church and State alike, has so often become. What a picture and guide we here behold for the Church of all ages! What a needed lesson is here taught! What errors and schisms would have been avoided throughout the long ages which have since elapsed, had the example of the apostolic Church been more closely followed, had power been more sympathetic with enthusiasm, and enthusiasm more loving, obedient, and submissive as regards authority! The Apostles recognised their own responsibility and acted upon their own sense of authority, and they sent forth Peter and John to minister in Samaria and supply what was wanting as soon as they heard of the work done by St. Philip. The persons whom the college of Apostles thus despatched are worthy of notice, and have a direct bearing on some of the great theological and social problems of this age. They sent Peter and John. Peter, then, was the messenger of the Apostles, -the sent one, not the sender. We can find nothing of the supremacy of Peter in these early apostolic days of which men began to dream in later years. The supreme authority in the Church and the burden of the Christian ministry were laid upon the Twelve Apostles as a whole, and they, as a body of men entrusted with co-equal power, exercised their functions. They knew nothing of Peter as the prince of the Apostles; nay, rather, when occasion demanded, they sent Peter as well as John as their delegates. The choice of these two men, just as their previous activity, depended again upon spiritual grounds, upon their love, their zeal, their Christian experience, not upon any official privilege or position which they enjoyed above the other Apostles. Surely in this view again the Acts of the Apostles may be regarded as a mirror of all Church history. The pretended supremacy of St. Peter above his brethren has been the ground on which the claim of Roman supremacy over all other Christian Churches has been urged. That claim has been backed up by forgeries like the False Decretals, where fictitious letters of Popes, dating from the first century downwards, have been used to support the papal assertions. But plain men need not go into abstruse questions of Church history, or into debates upon disputed texts. We have one undoubted Church history, admitted by all parties who profess and call themselves Christians. That history is the Acts of the Apostles, and when we examine it we can find nothing, about St. Peter, his life or his actions, answering in the remotest degree to that imperial and absolute authority which the Papacy claims in virtue of its alleged descent from that holy Apostle. The Acts knows of St. Peter sometimes as the leader and spokesman of the Apostles, at other times as their delegate, but the Acts knows nothing and hints nothing of St. Peter as the ruler, the prince, the absolute, infallible guide of his fellow Apostles and of the whole Church. Peter and John were the persons despatched as the apostolic delegates to complete the work begun by Philip. We can see spiritual reasons which may have led to this choice. Peter and John, with James his brother, had been specially favoured with Christ’s personal communications, they had been admitted into His most intimate friendship, and therefore they were spiritually eminent in the work of Christ, and peculiarly fitted to do work like that which awaited them in Samaria, -pointing Christian men to the great truth, that eminence in Christ’s Church and cause will evermore depend, not upon official position or hierarchical or ministerial authority, but upon spiritual qualifications and the vigour of the interior life. How wonderfully has the prophecy involved in the preeminence of Peter, James, and John been fulfilled. When we look back over the ages of Christian labour which have since elapsed, whose are the foremost names? Whose fame as Christian workers is the greatest? Not popes or princes, or bishops of great cities, but an Augustine, the bishop of an obscure African see; an Origen, a presbyter of Alexandria; a Thomas A Kempis whom no man knows; or presbyters like John Wesley, or George Herbert, or Fletcher of Madeley, or John Keble; -men like them, holy and humble of heart, obscure in station or m scenes of labour, they have lived much with God and they have gained highest places in the saintly army, because they were specially the friends of Jesus Christ. The world knew nothing of them, and the men of affairs and the children of time, whose thoughts were upon rank, and place, and titles, knew nothing of them; and such men had their reward perhaps, they gained what they sought; but the despised ones of the past have had their reward as well, for their names have now become as ointment poured forth, whose sweet fragrance has filled the whole house of the Lord. II And now why were Peter and John sent to Samaria from Jerusalem? They were doubtless sent to inspect the work, and see whether the apostolic approval could be given to the step of evangelising the Samaritans. They had to form a judgment upon it; for no matter how highly we may rate the inspiration of the Apostles, it is clear that they had to argue, debate, think, and balance one side against another just like other people. The inspiration they enjoyed did not save them the trouble of thinking and the cosequent danger of disputation; it did not force them to adopt a view, else why the debates we read of concerning the baptism of Cornelius, or the binding character of circumcision? It is clear, from the simple fact that controversy and debate held a prominent place in the early Christian Church, that there was no belief in the existence of infallible guides, local and visible, whose autocratic decisions were final and irreversible, binding the whole Church. It was then believed that the guidance of the Holy Spirit was vouchsafed through the channel of free discussion and interchange of opinion, guided and sanctified by prayer. Peter and John had to go down to Samaria and keenly scrutinise the work, so as to see whether it bore the marks of Divine approval, completing the work by the imposition of their hands and prayer for the gifts of the Holy Ghost. The Apostles duly discharged their mission, and by their ministry the converts received the gift of the Holy Spirit, together with some or all of those external signs and manifestations which accompanied the original blessing on the day of Pentecost at Jerusalem. This portion of our narrative has been always regarded by the Church, whether in the East or the West, as its authority for the practice of the rite of confirmation. The assertion of the Church of England, in one of the collects appointed for use by the bishop in the Confirmation Service, may be taken as expressing on this point the opinion of the Churches—Roman, Greek, and Anglican. "Almighty and everliving God, who makest us both to will and to do those things that be good and acceptable unto Thy Divine Majesty; We make our humble supplications unto Thee for these Thy servants, upon whom (after the example of Thy holy Apostles) we have now laid our hands, to certify them (by this sign) of Thy favour and gracious goodness towards them." Let us reflect for a little on these words. The reference to apostolic example in this collect is not. indeed, merely to this incident at Samaria. The example of St. Paul at Ephesus, as narrated in the nineteenth chapter, is also claimed as another case in point. There we find that St. Paul came to a place where he had previously laboured for a short time. He discovered in Ephesus some disciples who had received the imperfect and undeveloped form of teaching which John the Baptist had communicated. A sect had apparently been already formed to continue John’s teaching, such as we still find perpetuated amid the wilds of distant Mesopotamia, in the shape of the semi-Christian society which there practises daily baptism as a portion of its religion.148 St. Paul explains to them the richer and fuller teaching of Christ, commands them to be baptised after the Christian model, by one of his attendants, and then, like Peter and John, completes the baptismal act by the imposition of hands and prayer for the gift of the Spirit. These two apostolic incidents are not, however, the only scriptural grounds which can be alleged for the continued use of. confirmation. It might be said that the practice of the Apostles was not sufficient to justify or authorise confirmation as a scriptural rite, unless it can be shown that the imposition of hands, after baptism and as its completion, passed into the ordinary usage of the early Church. Let me here make a brief digression. The New Testament cannot be used as a guidebook to the whole life and practice of the early Church, because it was merely a selection from the writings of the Apostles and of their companions. If we possessed everything that the Apostles wrote, we doubtless should have information upon many points of apostolic doctrine and ritual concerning which we now can only guess, some of which would doubtless very much surprise us. Thus, to take an example, we should have been left without one single reference to the Holy Communion in all the writings of St. Paul, had not the disorders at Corinth led to grave abuses of that sacrament, and thus caused St. Paul incidentally to mention the subject in the tenth and eleventh chapters of his first epistle to that Church. Or to take another case. The "Teaching of the Twelve Apostles" has been already referred to and described. 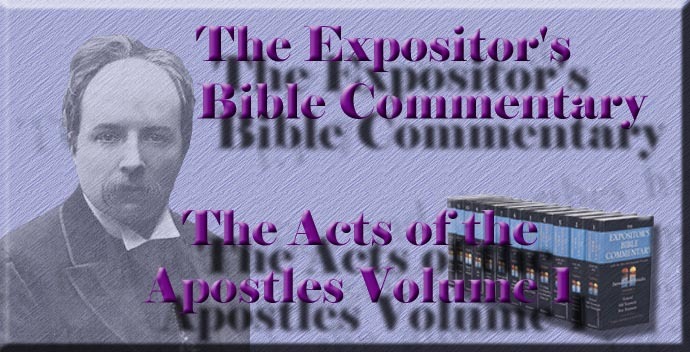 It is manifestly a manual dealing with the Church of apostolic times, and there we find reference to customs which were practised in the Apostolic Church, to which no reference, or at least very slight reference, is made in the Epistles or other books of the New Testament. The Apostles practised fasting as a preparation for important Church actions, as we learn from the account of the ordination of Paul and Barnabas at Antioch. The "Teaching of the Apostles" shows us that this practice, derived from the Jews, was the rule before baptism (of this we read nothing in the New Testament), as well as before ordination (of this we do read something), and that not only by the persons to be baptised, but by the ministers of baptism as well.149 It mentions Wednesday and Friday fasts as instituted in opposition to the Monday and Thursday fasts of the Jews; it shows how the lovefeasts of the Primitive Church were celebrated, and sheds much light upon the Order of prophets and their activity, to which St. Paul barely alludes. If we could regain the numberless writings of the Apostles and other early Christians which have perished, we should doubtless possess information upon many other practices and customs of early Church life which would much surprise us. The New Testament cannot than be used as an exhaustive account of the Primitive Church; its silence is no conclusive argument against apostolic origin or sanction as regards any practice, any more than the Old Testament is to be regarded as an exhaustive history of the Jewish nation. And yet, though we speak thus, confirmation or laying on of hands upon the baptised as the completion of the initial sacrament is not left without notice in the Epistles. The imposition of hands as the complement of baptism did not cease with the Apostles and was not tied to them alone, any more than did the use of water in the sacrament of baptism itself cease with the Apostles, as some of the Society of Friends have contended, or the imposition of hands in ordination terminate with apostolic times, as others have argued. This appears from two passages. St. Paul, in the twenty-second verse of the fifth chapter of 1 Timothy, when dealing with Timothy’s conduct in the usual pastoral oversight of the Church, lays down, "Lay hands suddenly on no man." These words referred not to ordination, for St. Paul had passed from that subject and was treating of Timothy’s ministerial conduct towards the ordinary members of his flock, directing how he was to care for their souls, reproving publicly the notorious transgressor, and putting him to open shame. We admit, indeed, at once that this notice of the imposition of hands may refer to another use of it which was practised in the early Church. St. Paul may be referring to the imposition of hands when a lapsed or excommunicated member was re-admitted into the Church; or both uses of the ceremony, in confirmation as well as in absolution, may be included under the one reference. But in any case we have another distinct, though incidental, mention of this rite, and that at a time, in a manner, and in a book which clearly proves the practice to have passed into the general custom of the Church. Let us see how this is. The Epistle to the Hebrews was written by one of the second generation of Christians, one of the generation who could look back to and wonder at the miracles and gifts of the apostolic age. The writer of the Hebrews tells us himself that he was in this position; for when speaking, in the opening of the second chapter, concerning the danger of neglecting the Gospel message, he describes it as a "great salvation; which having at the first been spoken through the Lord, was confirmed unto us by them that heard; God also bearing witness with them, both by signs and wonders, and by manifold powers, and by gifts of the Holy Ghost, according to His own will." So that it is evident that the Church of the Hebrews was the composition of a man who belonged to a time when the Church had passed out of the fluid state in which we find it in the earlier chapters of the Acts. It had passed into a condition when rites and ceremonies and Church government and ecclesiastical organisations had crystallised, and when men repeated with profoundest reverence the forms and ceremonies which had become associated with the names and persons of the earliest teachers of the faith; names and persons which now were surrounded with all that sacred charm and halo which distance, and above all else, death, lend to human memories. There is an interesting passage in Tertullian which shows how this feeling worked among the early Christians, making them anxious in divine worship to repeat most minutely and even absurdly the circumstances of the Church’s earliest days. In Tertullian’s works we have a treatise on Prayer, in which he expounds the nature of the Lord’s Prayer, going through it petition by petition, proving conclusively that Tertullian and the Christians nearest the apostolic age knew nothing of that modern absurdity which asserts that the Lord’s Prayer should not be used by Christians. He then proceeds to explain certain useful customs, and to reprove certain superstitious ceremonies practised by the Christians of his day. He approves and explains the custom of praying with hands outstretched, because this is an imitation of our Lord, whose hands were outstretched upon the cross.150 He disapproves of the practice of washing the hands before every prayer, which Tertullian says was done in memory of our Lord’s Passion, when water was used by Pilate to wash his hands, and designates as superstitious the custom of sitting down upon their couches or beds after they had prayed, in imitation of Hermas who wrote the "Shepherd," of whom it was said, that after finishing his prayer, he sat down on his bed.151 Now this last instance exactly illustrates what must have happened in the case of the second generation of Christians, to whom the Epistle to the Hebrews was directed. Men at the end of the second century, when Tertullian lived, looked back to the Shepherd of Hermas with the same profound reverence as to the Apostles. They imitated, therefore, every action and ceremony practised by the Shepherd, whom they regarded as inspired, reading his writings with the same reverence as those of the Apostles. See about this curious sect of the Hemero-baptists Lightfoot's vColossians , pp. 402-407. The order for adult baptism in the Book of Common Prayer was drawn up by the divines of the Restoration. They must have been well skilled in Christian antiquity, for they lay down expressly the same rule as the Teaching of the Apostles . They order that notice shall be given of an adult's baptism a week at least beforehand, that the persons to be baptized may be duly exhorted to prepare themselves by prayer and fasting for that holy ordinance. There is no ceremony which proves more conclusively the identity between the ritual of apostolic ages and, say, of the year 200, than this custom of standing at public prayer with hands outstretched. St. Paul, writing to Timothy (1 Tim. ii. 8), says, "I desire therefore that the men pray in every place, lifting up holy hands," and then he prescribes rules for the women. This passage will not be understood in its full force till one grasps the notion of an early Christian at prayer, as described by Tertullian in the treatise on Prayer to which I have referred. Tertullian lays down, with other writers of the second century, that Christians should pray in public on the Lord's Day standing with the hands lifted up and the arms stretched out horizontally. On this point the practices of the East and West alike were identical, and had not changed one atom from St. Paul's to Tertullian's time. From the way some people speak one would think that the Christians of the second century were wild revolutionaries, who were only too anxious to change the ritual derived from apostolic days. Tertullian's works prove that they were, on the other hand, almost too slavish in their adherence to ancient customs. Human nature is the same in every age, and a moment's reflection will show us that whether in England, Scotland, or Ireland, the ritual of old-fashioned congregations of every denomination is the same to-day as in the seventeenth century. A few instances occur to me which illustrate this. Dean Hook, in a letter dated April 5th, 1838, tells us that the old Presbyterian way of administering the Holy Communion, carrying the elements to the communicants sitting in their pews, still existed in the parish church of Leeds. The custom had been introduced early in the seventeenth century, and never was discontinued, notwithstanding a plain rubric forbidding it. I have read that the same custom prevailed at St. Mary's in Oxford, when Newman became Vicar. Again, down to a few years ago, in the country parts of Ulster and Connaught, the separation between the sexes in public worship continued among the Methodists, in obedience to John Wesley's law made one hundred and twenty years before. It is two hundred years since Sternhold and Hopkins' version of the Psalms was authoritatively laid aside, and Tate and Brady substituted. Yet I have within the last ten years seen Prayer-books in use at Bolton Abbey in Yorkshire, with Sternhold and Hopkins attached to them. Surely the early Christians were at least as Conservative as their modern followers. See Tertullian on Prayer, in his Works, vol. i., pp. 188-92, as translated in Clark's Ante-Nicene Library. I was much struck the other day with a modern instance of this. The Plymouth Brethren boast themselves as the least traditional of sects. They are, however, just at present split all the world over into two divisions, the great subject of debate being the writings of a Mr. Raven. He has ventured upon some perilous speculations concerning the nature of Christ's person. I have seen a formal indictment drawn out by his opponents, in which his opinions are contrasted with statements in the writings of their founder, the late J. N. Darby, which are evidently the final authority and standard of appeal for them. Thus in 1 Cor. xi. 2 St. Paul says, "Now I praise you that ye remember me in all things, and hold fast the traditions, even as I delivered them to you," and then goes on to discuss the question of veiling of women, showing the character of the traditions thus delivered. With this verse may be compared similar references in 1 Cor. vii. 17, 2 Thess. ii. 15 and iii. 9. See Tertullian on Baptism, chap. vi., where he says, "Not that in the waters we obtain the Holy Spirit, but in the water, under the influence of the angel, we are cleansed, and thus prepared for the Holy Spirit." And again, in chap. viii. he describes the course followed after baptism thus: "In the next place the hand is laid on us, invoking and inviting the Holy Spirit through the words of benediction." To pass from Tertullian to a very different witness, we may note that Calvin in his commentary on Heb. vi. 2 says, "This one place abundantly testifies that the origin of this ceremony (imposition of hands on the baptized) came from the Apostles." He differs from Tertullian, however. Calvin does not view it so much as a channel of Divine grace as a rite for profession of faith and solemn prayer, and as such would have confirmation continued as a necessary complement of infant baptism. Compare 1 Cor. vi. 19 with Heb. vi. 4, 5.